The next Star Wars Battlefront II update will bring a Capture-The-Flag style mode to the game. EA community manager Mat Everett posted some of the changes arriving in the patch on the Battlefront forums over the weekend. Clone Wars DLC is coming to Star Wars Battlefront II. Patch 1.2 will bring Jetpack Cargo to the game for a limited time. Similar to CTF modes in many other games, Jetpack Cargo requires two teams of players to make a rush for a neutral payload in the centre of the map, before delivering it to the opposing team’s base. This being Star Wars, however, there are of course jetpacks to help (and hinder) your progress. 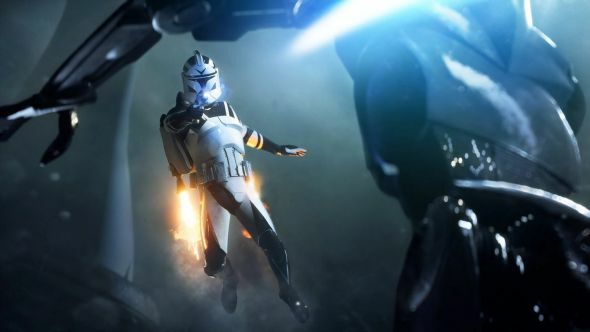 As well as the limited-time addition, the patch will bring updates to arcade mode, balance a series of Heroes and Villains (including Luke, Chewie, Rey, Kylo Ren, Darth Vader and Yoda, to name but a few), and tweaks to standard classes, reinforcements, and core combat. Everett says that while some of the issues highlighted on the game’s Known Issues forum post are getting patched, penty aren’t, but the team will continue to work on them going forward. Full patch notes will be published closer to the release of the patch, but Everett says even he doesn’t know when that’ll be. Nevertheless, we’ll make sure to keep you up to date.